But before we left, we got to try the famous local smoked pork (babi se'i). Which we found interesting as it was the first day of Ramadan. Indonesia may be the world's most populous Muslim country, but there are certainly non-Muslim pockets here and there. Kupang, for instance, is primarily Protestant. The smoked pork was super yummy as was the crispy pork belly. 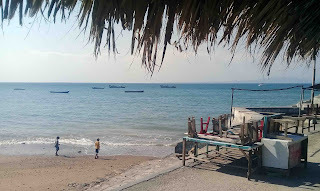 Good pork or not, we were not sorry to leave Kupang because the anchorage continued to be uncomfortable the whole time we were there. A side swell originating from who-knows-where kept the boat rocking non-stop. Also, there is no good place to leave a dinghy. The beach near where we anchored goes completely awash at high tide and the next beach over is frequented by touts who demand a high price to "watch" your dingy. There were even some reports of dinghies being damaged if the "watching" fees weren't paid. Luckily, a gentleman named Lambert lives on the beach and for a small fee will watch your dinghy, including taking it out to a mooring and swimming back in (which he manages pretty well considering he only has one functional leg). With Kupang in the rear view mirror, we started on a nice downwind run with 7+ knots wing-on-wing (main triple-reefed again because the winds were strong once again). The strong winds lasted until the following day and we expected we would need to slow down in the evening to have a first light arrival. Around dusk on the second day the winds started to moderate. Forget about slowing down, it was looking like we might be in for a late morning arrival. Finally, after losing even more steam, the wind went completely AWOL in the evening and died. From 25 knots to nothing in the span of about 4 hours. Because the waves were still up and banging the sails around, we turned on an engine and motored until the wind decided to reappear a few hours later and picked up to a brisk pace that got us to Komodo in the early morning after all. We picked up a mooring (made challenging by the howling wind) and the wind has been blowing like stink ever since. On the plus side, we saw our dragons. 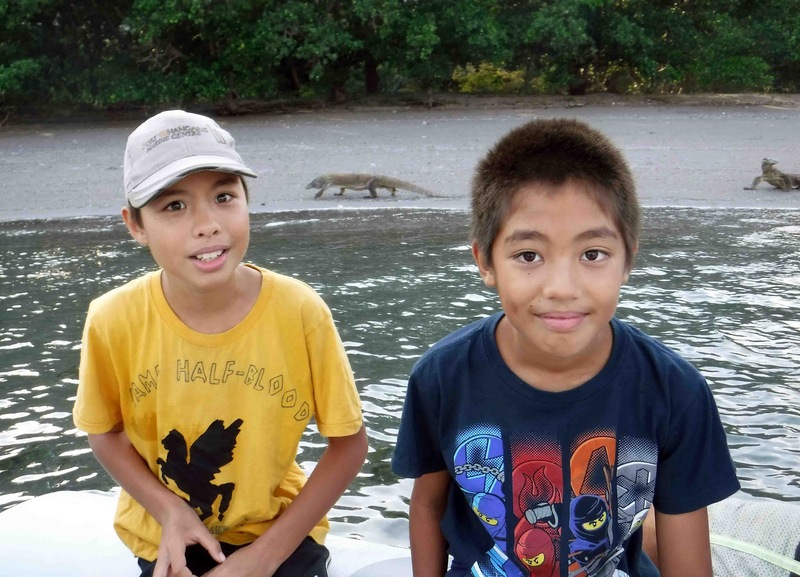 When Matt was little, he saw Komodo dragons on Wild Kingdom (the original one with Marlin Perkins--yes, we are old: there aren't reading glasses everywhere on our boat for nothing). He was very disappointed to learn that they were on the opposite side of the world because it seemed impossible that he'd ever get to see one in real life. And yet here we are. So touching--excuse me, I have something in my eye. Do they look nervous? Yes, yes they do. But for real, Komodo dragons are very cool, in large part because you know they could kill you with one bite (in the absence of good medical care, which around here is scarce). We stayed in our dinghy when these guys came swaggering out of the undergrowth at the sound of the engine ('Um, Dad, maybe we should back the dinghy up...' was heard more than once). 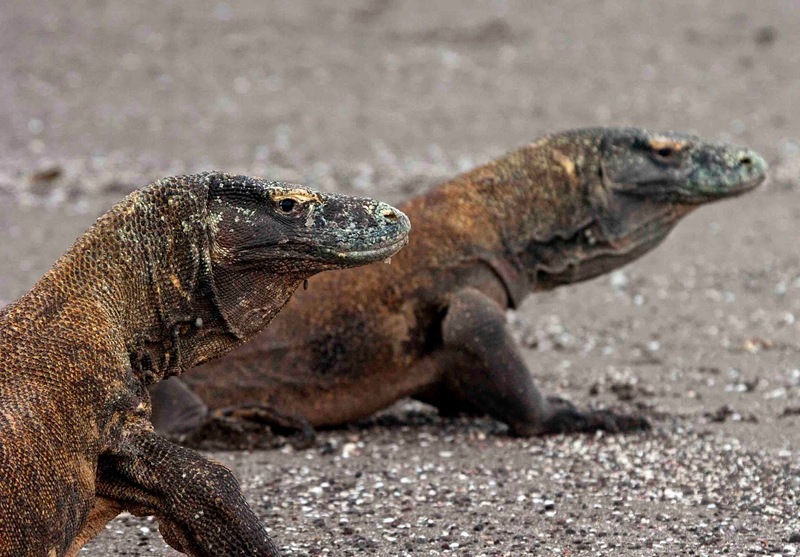 Anyway, they are huge, menacing and prehistoric-looking. The non-stop drooling and tongue flicking doesn't make them look like puppy dogs, either. And it turns out that they can swim, which we didn't realize until we read more about them later because they gingerly avoided the water's edge like they didn't want to get wet. Fortunately they hadn't felt like spanning the three feet of water between us. I was just going to email you to tell you I read that these dragons are fantastic swimmers being able to swim between the islands. Glad that they didn’t feel like getting wet!! Hope they stay well away from your boat.